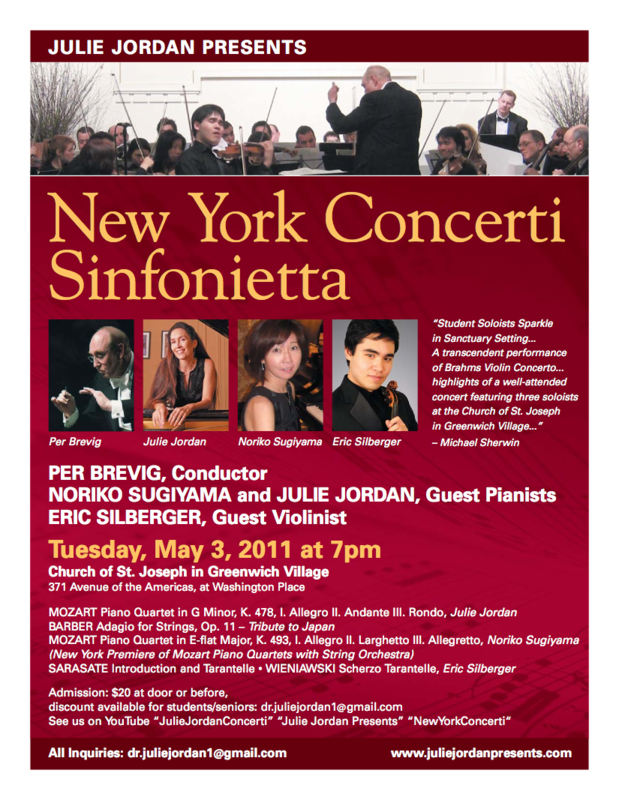 NEW YORK — For her fourth and final program of the 2010-11 season, Julie Jordan presented a concert of uncommon interest May 3 at the Church of St. Joseph in Greenwich Village. Termed a “Tribute to Japan,” it featured Samuel Barber’s “Adagio for Strings” played in memoriam, as well as what was billed as the New York premiere of Mozart’s two Piano Quartets with string orchestra, each with a different solo pianist. Flying in from Japan specifically to perform at this concert was pianist Noriko Sugiyama, a former pupil of Julie Jordan; the other soloist was Julie Jordan herself. Lastly, Eric Silberger, who had given a transcendent performance of the Brahms Violin Concerto at Julie Jordan’s previous concert on March 24, returned to play two virtuoso encore pieces to end the evening on a lighter note. It was a matter of considerable curiosity as to how well the Mozart Piano Quartets would stand up to being played by a string orchestra instead of just a single violin, viola, and cello, particularly since this was apparently the first time the works had been performed in this manner in New York. Fortunately, the results were a triumph for all concerned. It seemed almost as if two newly discovered works by Mozart had been added to the repertoire. It was also fascinating to hear and compare the differences in approach between the two highly capable soloists. Dr. Jordan deserved praise for devising the innovative and successful concept of performing the Mozart Piano Quartets as works for piano and orchestra. On this occasion, the orchestral ensemble was comprised of fourteen players: six violins, four violas, three cellos, and one string bass doubling the cello part an octave lower, ad libitum. As was the case for all four concerts this season, the excellent group performed under the experienced baton of guest conductor Per Brevig. At this concert, Dr. Jordan was soloist in Mozart’s Piano Quartet No. 1 in G Minor, K. 478, a work of sublime profundity and expressivity. Any doubts as to how effective its arrangement for piano and string orchestra would be were instantly assuaged by hearing the weighty sonorities of the emphatic question-and-answer dialogue of its opening bars. Typifying the Sturm und Drang (“Storm and Stress”) style of the Classical period – characterized by minor keys, angular themes, sudden dramatic changes in dynamics, and pulsing, syncopated rhythms reflecting passionate emotions – the Quartet’s poignancy and aesthetic impact were notably heightened and magnified by the larger performing forces. Dr. Jordan justifiably approached the work as if it was a piano concerto, emphasizing the primacy of the soloist and never leaving any doubt who was in charge. Playing in a leonine manner with full-blooded sonority, she displayed a rich tone, a solid bass line, and admirable articulation. At times, the Piano Quartet in its orchestral dress sounded like a previously unknown Mozart concerto, with foreshadowings of Beethoven. In the second movement andante, containing some of Mozart’s most heavenly and rhapsodic piano writing, Dr. Jordan’s sensitive playing was distinctive for its expressive quality, dynamic nuance, and tasteful delineation and shaping of phrases. Her fluid and fleet finale, played with appropriate assertiveness, brought the work to an inexorable and powerful finish. Throughout, her playing was notable for its intellectual probity, attention to detail, thoughtfulness, and stylistic awareness. The two Mozart Piano Quartets were separated by a touching performance of Barber’s “Adagio for Strings,” itself arranged for string orchestra by the composer from the second movement of his String Quartet, Op. 11. Played as a tribute to Japan for its recovery, it provided a measure of consolation in the wake of uncountable fatalities and tribulations of almost biblical proportions resulting from earthquake, tsunami, and nuclear contamination. It was a fitting choice. The Adagio’s piercingly sad harmonic suspensions and slow, sinuous, melismatic melodies – groping ever upward like tendrils reaching for the light – finally reach a fortissimo climax of shatteringly powerful emotional intensity in the highest registers of the orchestra. After a dramatic pause, it then abruptly subsides into softer and deeper sonorities, ending by dying away on a note of resignation and possible hope. Per Brevig led a restrained and dignified reading of the work, abetted by the committed playing of the orchestra. Noriko Sugiyama, soloist in Mozart’s Piano Quartet No. 2 in E-Flat Major, K. 493, is herself a seasoned performer. She has taught at the Yamaha Music Foundation in Japan for more than 22 years, and was a finalist in the 2009 Boston International Piano Competition. From 2007 through 2009, she studied with Dr. Julie Jordan in the Evening Division at The Juilliard School, returning to New York this month to appear in this “Tribute to Japan” concert. Ms. Sugiyama’s playing was impeccably well-schooled, beautifully refined, and highly fluent, reflecting her distinguished pedigree. In what was also a valid approach, she seemed to conceive of her role as one among equals rather than as soloist, blending with the orchestra in chamber music fashion even at the risk of occasionally becoming overbalanced by their augmented numbers. Ms. Sugiyama’s larghetto second movement was limpid and songful, in a very natural and unforced manner. In the final movement rondo, she shed her deference, playing with a considerably wider range of keyboard colors, animation, and accent. Relaxed and easygoing at first, she gathered momentum and velocity most impressively, catching the music’s carefree high spirits and witty, playful nature, bringing this masterpiece to a most satisfying conclusion. In both Mozart works, the strings of the New York Concerti Sinfonietta sounded ravishingly beautiful under the caressing leadership of Per Brevig, with especially alert playing by the lone double bassist who had to play rapid melodic lines not originally intended for his instrument. Hearing the Mozart Piano Quartets in orchestral arrangements was a voyage of discovery that afforded a new and welcome perspective on these cherished works. Silberger dispatched the Sarasate and Wieniawski pieces with flair and panache. The lyric cantabile sections were beautifully shaded, while the perpetual motion passages were executed with such rapidity and amazing articulation as to induce disbelief. His harmonics were spot-on; his position changes were lightning-fast. So accurate were his octave jumps it seemed as if his fingerboard had been fitted with guitar-like frets. At Julie Jordan’s third concert of the season on March 24, Silberger was soloist in a memorable performance of the Brahms Violin Concerto, supported by a 41-piece orchestra. Silberger is presently participating in the Columbia University-Juilliard School Joint Program. At Juilliard, he studies violin with Glenn Dicterow, concertmaster of the New York Philharmonic. Concurrently, he is graduating this year from Columbia University with a B.A. in Political Science. Mr. Silberger’s riveting, rhapsodic performance of the Brahms exhibited extraordinary commitment and temperament. He played with complete security, flawless intonation, incisive bowing, beautiful tone, and expressive vibrato. Even when attacking the most forceful passages with ferocity, he never overloaded his instrument. His interpretation was majestic and exciting: confident in its technical command; heartfelt and touching in its emotional honesty. His phrasing was as natural as breathing. Conductor Per Brevig skillfully balanced the orchestra throughout so that it did not cover the soloist. Silberger played the Joachim cadenza to the first movement with gypsy fire and abandon, while making it seem like an integral part of the work rather than an excuse for empty virtuoso display. The interpretative integrity of Mr. Silberger’s Brahms evoked reminiscences of such “Golden Age” violinists as Nathan Milstein and David Oistrakh, abetted by the glowing timbre of the 17th-century Andrea Guarneri violin on which Silberger performed. When Brahms’s Violin Concerto was new – over 130 years ago – its apparent austerity and classical restraint were often misunderstood. A year after the concerto’s premiere, the composer Tchaikovsky wrote a letter to his patroness, Nadezhda von Meck, in which he scornfully stated, “The opening of the concerto…is an admirable pedestal for a statue; but the statue is lacking, we only get a second pedestal piled upon the first.” Tchaikovsky was wrong. Eric Silberger did indeed give us the statue; a heroic one, chiseled out of the finest marble and imposing in its proportions. Silberger, at age 22, may well be on the threshold of a major career. Currently, he is the only American to be simultaneously selected to participate in two prestigious, upcoming violin competitions: the International Tchaikovsky Competition in St. Petersburg and the Michael Hill International Competition in New Zealand. His future performances will be awaited with anticipation. Michael Sherwin has held Rockefeller and Fromm Foundation Fellowships in music criticism. He has written for The Juilliard Journal, Musical America, and Wagner Notes.